The Chargers relocation to the city of Los Angeles has nothing to do with football but more so with the arms race among owners to build futuristic stadiums. There is no good football reason to cheer the San Diego Chargers’ long-plotted northward march to Los Angeles, which became official on Thursday. A city that had demonstrated no great yearning for professional football has now been stuck with two teams in the last 13 months—not good teams, either, but historically middling franchises that have lately hit bottom. They have combined for one playoff appearance in the last seven seasons. Neither has a head coach; both finished in the league’s bottom seven this year. The Chargers have gone sideways for the better part of a decade now, squandering Philip Rivers’s prime. The Rams have been worse, failing to field a top-20 offense in any of the last 10 years. In 2016, they ranked last in yards gained for the second straight season. The people of Los Angeles probably would have preferred getting a second David Spade to getting a second so-so NFL franchise. But the relocation circus of the last two years never had a whit to do with what the people of Los Angeles wanted, or for that matter with football. It had everything to do with the arms race among owners to build the most futuristic and opulent stadiums possible, which began in earnest in 2005, when the City of Arlington broke ground on Jerry Jones’s $1.2 billion palace in Dallas. It opened in ’09 as the sport’s first ten-figure stadium. The Jets and Giants owners topped that just the next year, with the ribbon-cutting at the $1.6 billion MetLife Stadium. Then came the $1.3 billion Levi’s Stadium in Santa Clara in ’14, and the $1.1 billion U.S. Bank Stadium in Minneapolis for 2016. And next year will bring the $1.5 billion Mercedes-Benz Stadium in Atlanta. This boom will reach its apogee with the expected 2019 opening of Stan Kroenke’s $2.6 billion Los Angeles Stadium and Entertainment District at Hollywood Park. (Two-plus billion buys you quite a mouthful.) That real-estate development, which will include offices, restaurants, TV studios, luxury hotels, and a theater in addition to the stadium, is nothing less than the reason the Rams were allowed to leave St. Louis last January. The proposed shared Chargers/Raiders building in Carson, Calif.? A puny $1.78 billion project. Hence NFL owners’ preference for Kroenke’s relocation application, and the Chargers’ looming status as his tenants. An observer from outside the sports world could reasonably conclude that the NFL is in actuality a trade group for land barons, and that the game of football is a front. Most owners seem to aspire to little more than keeping up with the Joneses—Jerry and Stephen, in this case. Each new stadium and each renovation pushes existing stadiums toward supposed obsolescence, hence the recent remodeling efforts at the Mercedes-Benz Superdome, Arrowhead Stadium, Bank of America Stadium, and at New Era Field. Lambeau Field has been renovated twice since 2000. (Recall, also, that the supposed decrepitude of the Edward Jones Dome—it had fallen out of the “first-tier” of NFL stadiums—allowed the Rams to break their lease in 2015.) What’s better than a new building when fans are footing the bill? A rising tide lifts all boats; construction seems to spur only more construction. Except, that is, in San Diego, where old Qualcomm Stadium has sat, unrenovated, since 1967. And will continue to sit, even as the Chargers get up and walk away. 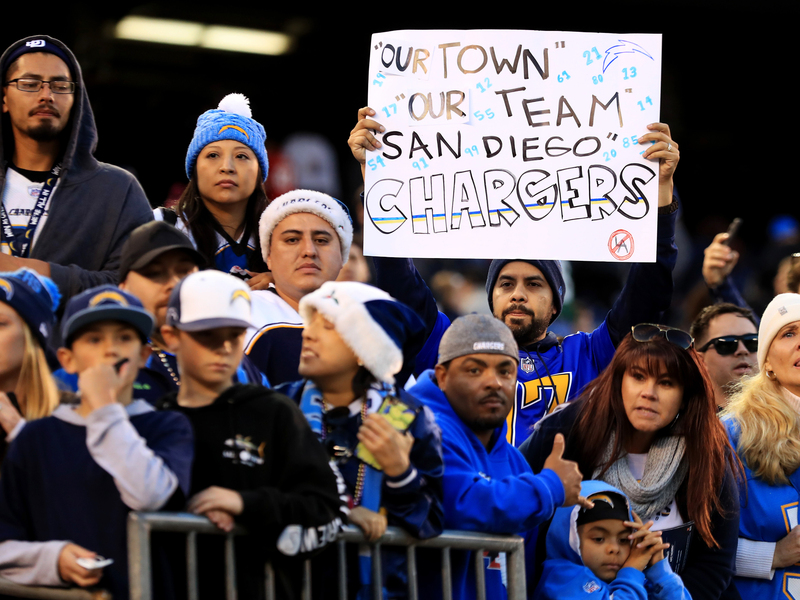 That was the outcome of the November vote that denied the Chargers public funding for a proposed $1.8 billion stadium in downtown San Diego. The ballot measure, which would have increased hotel taxes, needed two-thirds support to pass; it received a little over 40 percent. Though Chargers fans loathed owner Dean Spanos before the move and have probably seen their antipathy quadruple tonight, he looks like a hometown loyalist compared to Kroenke and the Raiders’ Mark Davis, who is currently trying to ditch Oakland for Las Vegas. Spanos wasn’t aching to move. Instead he was holding out for a deal that became less and less likely the more time passed. He had to fold sometime, and the league had imposed a Tuesday deadline. Then again, he was holding out for such a deal because he had looked around the league and saw that nearly every other owner had landed one. Spanos is not a singularly repulsive NFL owner but in fact one whose repulsive entitlement is the norm. Bizarrely, the only winners in all of this, as ESPN’s Mina Kimes pointed out, are the people of San Diego, who have successfully stuck it to a billionaire. Their reward is the loss of their beloved football team.